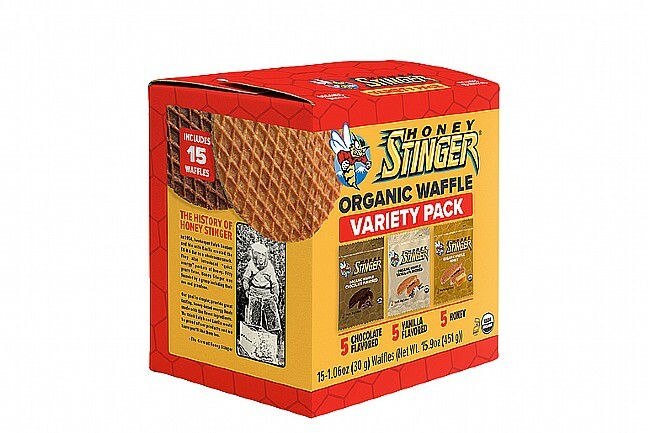 Honey Stinger's Organic Stinger Waffle (Mixed Box of 15) is available in a box of 15 individually wrapped stroopwafel-inspired mid- or post-ride snacks. These palm-sized treats are delicious, easy to eat on the go, and made of USDA certified organic ingredients that deliver the energy required to train and race hard. A welcome change from bars and gels. And, these things are so tasty I had to hide them from my kids. ,-) I made the mistake of sharing a few and they wanted them all.